In previous posts, we discussed stigma change processes and the use of TLC4 as a planning model for framing stigma change efforts. In both of those posts, we explored the effectiveness of contact-based strategies for decreasing stigma and offering realistic hope to those facing similar challenges. The success of contact-based strategies exemplifies that stories are powerful! People who advocate, broadcast their stories, and use their personal experiences as a foundation for helping others are exhibiting stigma resistance. Stigma resistance is an individual’s capacity to counteract both internalized stigma and public stigma. Proactive stigma resistance strategies are intentional, agentic responses that improve self-concept by confronting stigma and/or challenging the negative attitudes and behavior of others. Given that empowerment and stigma resistance go hand in hand, it is no wonder that stigma resistance is strongly and consistently associated with recovery and well-being! Stigma resistance operates at the personal, peer, and public levels. Let’s take a look at each of these levels using an example from a recent documentary film, Suicide: The Ripple Effect. This film documents the journey of Kevin Hines, who at 19 attempted to take his life by jumping from the Golden Gate Bridge, and how since then, he as catalyzed a movement to spread messages of hope, recovery, and wellness. At the personal level, stigma resistance focuses on alleviating internalized stigma and maintaining recovery. In the film, Kevin shares with the audience how he works diligently to cope with his “brain pain” and stay as mentally healthy as possible; he also gives insight into his will to live. He provides an inspirational example of someone who has developed an identity apart from his mental illness (as a husband, survivor, a storyteller, a public speaker, an activist, and a documentary filmmaker) as he vividly describes and exhibits how his survival has given him a new sense of meaning and purpose. 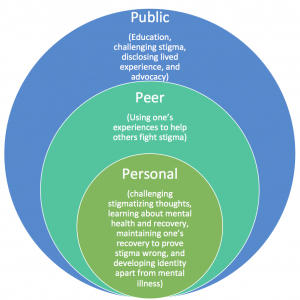 At the peer level, stigma resistance manifests as using one’s experience to help others fight stigma. This type of stigma resistance is exemplified by peer support workers and specialists who model recovery and offer lived examples of the possibility for growth and living a fulfilling, satisfying life. In “The Ripple Effect,” the audience is privy to a bird’s eye view of the many ways in which Kevin’s story has impacted individuals living with mental health challenges (see the story of a local man impacted by Kevin Hines) and the families of those who have lost loved ones to suicide. It is in these interactions with the people touched by Kevin’s story, where it is most evident that sharing one’s personal challenges and recovery can bring hope, healing, and support to others; even those who have experienced the tragedy of suicide. It is also in these interactions with those close to Kevin where we see how loved ones can meaningfully support, encourage and motivate stigma resistance. At the public level, the film is a powerful example of how stigma resistance can have a ripple effect that inspires others, touches countless lives, and creates positive change. Kevin’s advocacy combines education, sharing his lived experience, and challenging stigma related to mental health and suicide. If you would like to learn more about Kevin’s story and witness stigma resistance in action, join us for one of the upcoming local showings (in and near Milwaukee) that will take place during Mental Health Awareness Month this May. WISE will be partnering with Prevent Suicide Greater Milwaukee, NAMI Waukesha, MHA, and Waukesha’s Department of Health and Human Services, to provide three showings. Proceeds will support local youth suicide prevention efforts. Thanks to Rogers Behavioral Health for their sponsorship. Click here to watch the trailer, purchase tickets, and join the resistance!